In its first season, Cruise & Maritime will operate the Discovery for a period of 249 days. It is understood that the five-year charter, which has been described as a form of “joint venture” between All Discovery and Cruise & Maritime, will extend All Discovery’s product offerings from luxury and destination cruising into the value end of the market. Departures will be offered from five UK ports – Bristol, Liverpool, Hull, Newcastle and Harwich, together with fly-cruises to the Med and Black Sea in autumn 2013. The addition of fly-cruises is a new step for Cruise & Maritime, which up till now has operated on a cruise-only basis from the UK. Meanwhile, Voyages of Discovery will continue to operate with its new 550-passenger Voyager, which enters service on December 4. Being a single-sitting ship with a few extra balconies, the Voyager will bring a new standard of service to the style of discovery cruising that Voyages of Discovery operates, enabling guests to explore and learn about different destinations, cultures and history. (The bottom image is Alexander von Humboldt before conversion and the top image Voyager as converted, with modified blunt bow and the addition of thirty new balcony cabins). Cruise & Maritime’s 848-passenger Marco Polo will continue to operate year-round from Tilbury, with longer cruises on offer during the winter period. 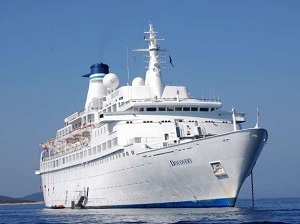 The lower capacity of Discovery compared to Ocean Countess will also mean that Cruise & Maritime will have about 10% fewer berths on its second ship, although the charter period will be different.